Ok, so I’m a blogger not a writer. I’m also a procrastinator. Which means things in my life that I have to get done, get done late, and things I don’t -updating my blog- get done really late. So here we are, a month and a half after my trip, posting an entry…. (or four months before I finish it). Fast forward to early December and I’m hoping on a plane to Calgary, excited, nervous, and wondering why I decided I could afford this trip. In case you’re wondering, the border patrol dude at the Calgary airport was really nice. He asked me why I was tired and who I was visiting, smiled and sent me on my way with my one way ticket, no problem. I have a few discrepancies on my record that I’ve heard the Canadian government doesn’t take a liking to, and thankfully I had zero problems entering Alberta. As it turned out, the friend I went to visit broke her tibia her first day skiing (ever) at Sunshine Village in Banff. I knew she had hurt her leg before my arrival, but we weren’t sure if she broke it until she went to the doctor after I got there. I was hoping to climb with her all week; now we were hoping she’d be able to walk normally in a month. My options became watching movies all week, or making new friends… you could guess that I chose the latter. 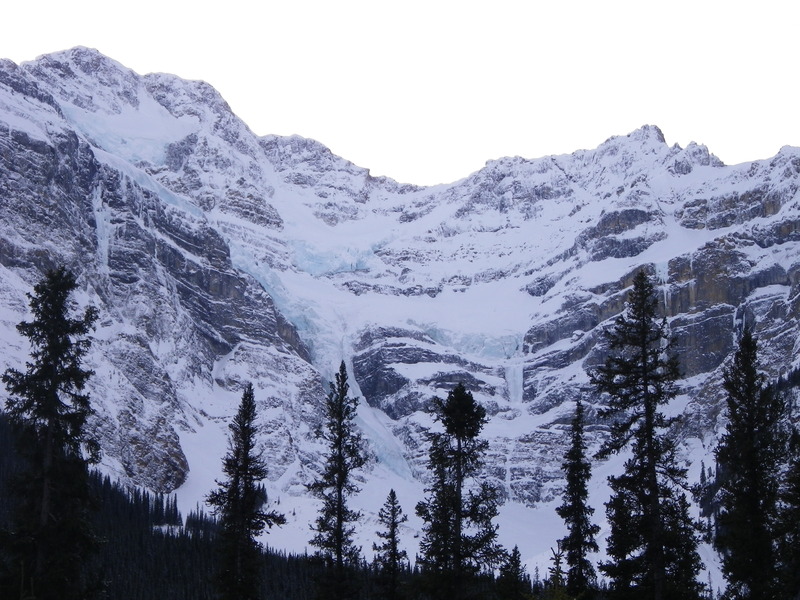 In any case, I highly recommend traveling to the Banff area if you like ice. There is an INSANE amount compared to the midwest…. and as far as I’ve heard, anywhere else in the world. I only ended up climbing 4 days (out of 6) and I’m already itching to go back. Day Two: The kids wanted to have a crag day so we headed to Hafner Creek. Once we get there I soon find out, it’s gonna be another mixed climbing day…. We all warmed up on a WI3 route and then the mixed madness began. I started on Half a Gonk (M6), followed it with Californication (M5) and finished on Swank (M8-)… all on top rope. After successfully climbing 3 mixed routes, I decided that I like mixed climbing… but I’m thinking I still prefer a good ice route. On day three I decided that I’d had enough of this mixed nonsense, and implored my keepers to find a good long ice route to spend the day on. 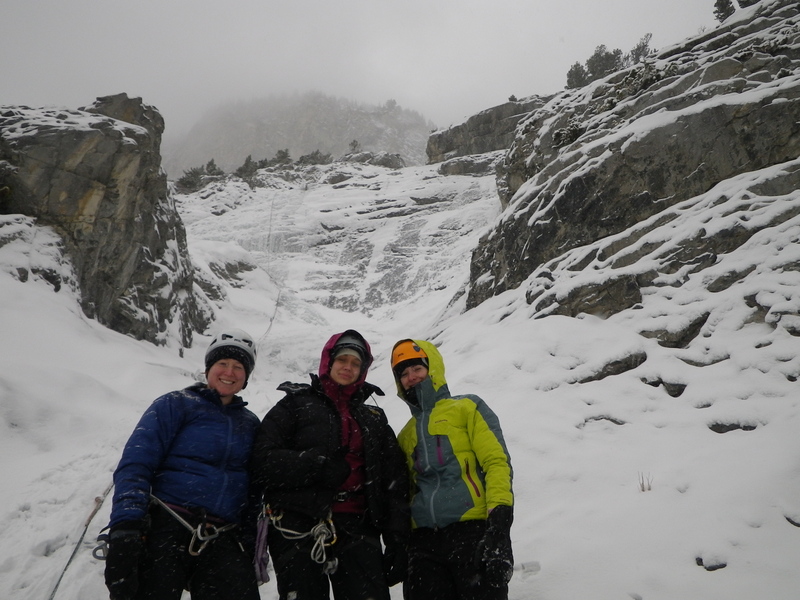 Unfortunately, it was super snowy, and avalanche conditions weren’t the best for doing routes. We headed to Cascade Mountain in Banff hoping to do Rogan’s Gully (III WI2/3). After a romp around in the snow trying to find the climb, we finally made it to the base. It ended up being a party day, with 6 climbers… 3 leaders, 3 followers. However, due to poor conditions, and someone getting an ice shard in the eye, we ended up bailing after the second pitch. I would love to head back and finish her someday. It was still a fun trip, but definitely not quite the epic-ness I’d hoped for. I spent my last day climbing in Kananaskis County at Thomas Creek. We ended up heading to Snowline, a really beautiful 100m III WI4. Nathan lead the first pitch, Shaira lead the second, and I soon realized I hadn’t led a single climb this trip. I was planning on leading the second pitch, but ended up getting the worst case of the ‘screaming barfies’ I’ve ever gotten on the way up the first pitch. Apparently it’s hard to climb and pull screws while following when it’s really really cold out. This was probably my favorite day, mostly because the route was pretty, and with just three of us climbing, there was a very cohesive group. It was worth getting the barfies to hang out (literally) and chat about ice while belaying, and taking in our surroundings. So I only got four days of climbing in before we had to head to Colorado… but it was still a great first experience in the Canadian Rockies. I was sad to leave, but also getting super pumped about the chance to learn how to snowboard at Crested Butte. This entry was posted in Trips & Destinations and tagged banff, canadian rockies, climb banff, grotto canyon, hafner creek, ice climbing. Bookmark the permalink. Sounds like a fabulous trip! Next time you might want to check out Louise Falls. 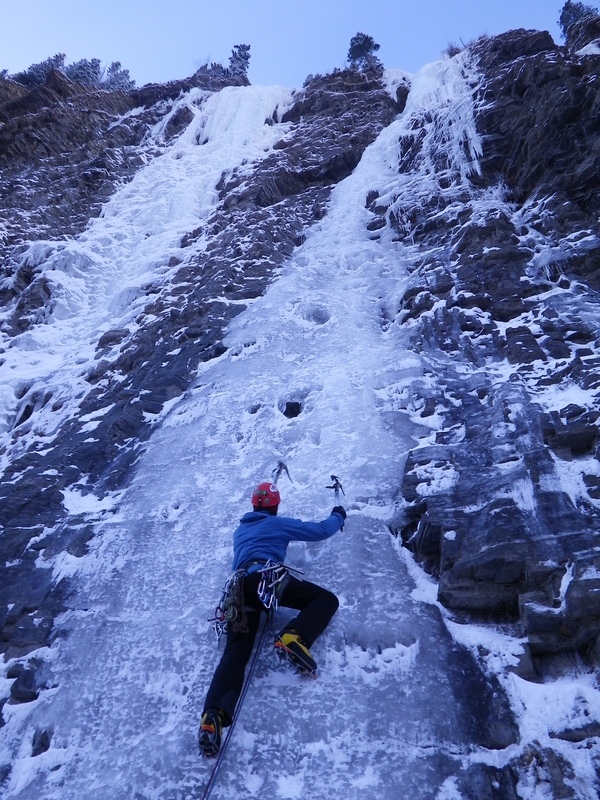 It was my first multi-pitch ice climb and it’s definitely one of the classics. Also – I’ve started bringing my ski mitts which have a pocket for handwarmers on really cold days. Great to have a toasty belay glove ready to go.